Importing through a Tax1099.com Excel spreadsheet template remains our most popular integration. Many of our accounting software integrations import to a 1099-MISC form. 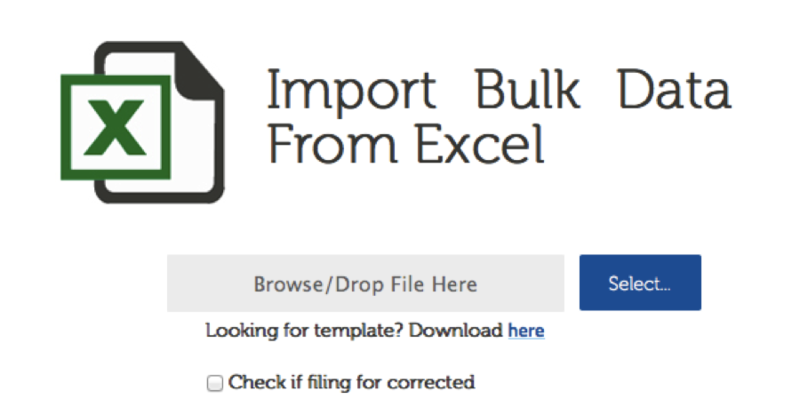 With the Excel import, many other forms are available. To begin, login to Tax1099.com. Navigate to the Import tab on the left side of the screen, and select "Excel Spreadsheet." You'll see all of the forms we offer. Select the form you'd like to file. On that page, click the link that says, "Download Here." Populate the template with your vendor information, then upload the file to the Tax1099.com screen. To upload the file, click the blue "Select" button, and search for the file. If you need to file corrected forms, select the check box underneath the upload bar. Your forms will come up in an import grid. Red dots in the vendor rows signify missing data, or data that isn't formatting as per IRS regulations. We use the red dots to alert you to issues that may cause the IRS to reject the form. This includes TIN's/zip codes that are not the correct length. If you're ready to submit and pay for all of your forms, click the "select all" checkbox in the top left corner of the grid. Scroll to the bottom of the screen to click "next." We schedule all forms to E-file with the IRS on the deadline date, March 31. Up to that date, you may edit your forms without having to file a corrected form. We also offer vendor form delivery. USPS, PDF to e-mail, and PDF to portal are our full-service delivery options. With our portal delivery service, we keep track of vendor opt-in statuses. This is a required part of electronic form delivery, according to IRS Publication 1179. You can also choose to download, print, and mail recipient form copies. PDF's of your forms are available in Tax1099.com. You can print these forms on blank paper and mail in a #10 double-window envelope. Import vendor data from an Excel template with Tax1099.com. Take advantage of a best-in-class e-filing solution.